Sudeep Sanjeev, better known mononymously as Sudeep or Kichcha Sudeep, is an Indian film actor, director, producer, screenwriter and television presenter, who primarily works in Kannada cinema, in addition to appearances in a handful of Telugu, Hindi and Tamil films. Sudeep is known for his performances in the Kannada films Sparsha (2000), Huchcha (2001), Nandhi (2002), Kiccha (2003), Swathi Muthu (2004), My Autograph (2006), Mussanjemaatu (2008), Veera Madakari (2009), Just Maath Maathalli (2010), Kempe Gowda (2011) and the Telugu-Tamil bilingual Eega (2012). He won the Filmfare Award for Best Actor – Kannada for three consecutive years for his films Huchcha, Nandhi and Swathi Muthu. Since 2013, he has been hosting the television reality show Bigg Boss Kannada. Sudeep was born to Sanjeev Manjappa and Saroja in Shimoga in Shimoga district, Karnataka. The family had migrated to Shimoga from Narasimharajapura. He obtained a bachelor degree in Industrial and production engineering from Dayananda Sagar College of Engineering, Bangalore. He represented the college in under-17 and under-19 cricket. He attended the Roshan Taneja School of Acting in Mumbai, where he overcame 'shyness'. Sudeep began his film career in Thayavva (1997). He then played a supporting role in Prathyartha, directed by Sunil Kumar Desai, and a lead role in the same director's Sparsha. In 2001, a role in Huchcha gave him his first big following. In 2008 he made his Bollywood debut in Phoonk. He has also starred in Ram Gopal Varma's movies Rann, Phoonk 2 and Rakta Charitra. They were followed by Kempe Gowda and Vishnuvardhana (2011). Sudeep made his debut in Telugu cinema in 2012, with S. S. Rajamouli's Eega, a fantasy film in which he portrayed an industrialist who, on falling for an NGO worker (played by Samantha Ruth Prabhu), kills her alleged lover, who begins to haunt him in the form of a housefly. The film and Sudeep's performance were highly acclaimed. In 2013, Bachchan and Varadanayaka were released. His next film was a drama titled Maanikya that he also directed, a remake of the Telugu film, Mirchi (2013). In 2015 he starred in Ranna, a remake of the Telugu film, Attarintiki Daredi, and played a cameo role as a Persian arms trader in Baahubali: The Beginning, directed by S. S. Rajamouli—the year's highest-grossing film. He frequently sings in his screen roles, including Vaalee (2001), Chandu (2002), Ranga SSLC (2004), Nalla (2004), #73, Shaanthi Nivaasa (2007), Veera Madakari (2009), Kempe Gowda (2011), Bachchan (2013)  and also for others movies such as Mandya to Mumbai (2014), Ring Road Shubha (2014) and Raate (2015). He has directed the Kannada movies My Autograph, #73 Shaanthi Nivaasa, Veera Madakari, Just Math Mathalli, Kempe Gowda and Maanikya. He also wrote the script for Just Maath Mathalli. He owns a film production company named Kiccha Creations, which is credited with My Autograph (2006). Sudeep made his TV debut in the serial Premada Kadambari, named after a line in the song Bandhana on Udaya TV. He was roped in to play the main host of the reality show Pyate Hudgeer-Halli Lifu, aired on Suvarna, which was an immediate success. Endemol Shine Group's flagship show Big Brother was adapted to Kannada as Bigg Boss Kannada and Sudeep was the chosen to play the host for the first season which was aired on ETV Kannada. He continued to host the second season on Asianet Suvarna. Colors Kannada (formerly ETV Kannada) regained the rights to the show in 2015 with Sudeep signing a five-season deal to host the show which was estimated to be around ₹20 crore (equivalent to ₹23 crore or US$3.1 million in 2018) which was a landmark deal in Kannada television industry. Sudeep is the captain of Karnataka Bulldozers cricket team that competes in the Celebrity Cricket League. Sudeep has been described by the critics as one of the most talented actors in Kannada cinema. He was listed first in the Times 25 Most Desirable Men in Bangalore in 2012. In 2012, he was given a title, "Abhinaya Chakravarthy", by a Kannada organization, Karnataka Rakshana Vedike. In 2012, Sudeep was signed as the Brand Ambassador of Joyalukkas, a Jewellery Retail Chain. In 2013, he was appointed as the Brand Ambassador for Bangalore Traffic Police Department and Income Tax Department. In 2014, he was appointed as the Brand Ambassador for Intex Technologies (India) Mobiles & Paragon Footwear. 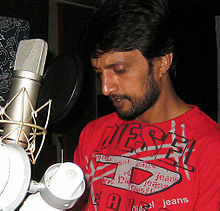 In 2013, on World AIDS Day, Sudeep teamed up with Vijay Raghavendra and other actors to record voiceovers for the TeachAIDS interactive software, developed at Stanford University. In 2015, Sudeep appeared in advertisements in the Kannada language for OLX.in, along with the veteran Kannada actor, Anant Nag. He had previously appeared in ads with Sadhu Kokila for the same company. ^ "Fame flies for Sudeep". The Hindu. 2 August 2014. Retrieved 12 April 2015. ^ "Kichcha Sudeepa (@KicchaSudeep) | Twitter". twitter.com. Retrieved 2019-01-21. ^ Sudeep (24 April 2016). Weekend with Ramesh Season 2 - Episode 33 - April 23, 2016 - Full Episode (in Kannada). ozee.com. Event occurs at 16:35. Retrieved 15 August 2016. ^ "Sudeep Sanjeev – 'Sparsha' of the Kannada film industry". bangalorebest.com. Retrieved 1 October 2014. ^ K Rajani Kanth and Varada Bhat (2012-07-10) Eega 'flies high' at box office. Business Standard. ^ Here’s why SS Rajamouli ‘Baahubali’ is India’s biggest blockbuster. Indian Express (17-July-2015). ^ Sudeep Filmography, Sudeep Movies, Sudeep Films. entertainment.oneindia.in. ^ "Just Math Mathalli is for die-hard romantics". Movies.rediff.com. 2010-02-05. Retrieved 2011-03-10. ^ "Sudeep to host reality show". sify.com. 10 May 2010. ^ Actor Sudeep to anchor ‘Pyate Hudgeer, Halli Lifu’ on Suvarna Archived 29 October 2013 at the Wayback Machine. Exchange4media.com (2010-05-08). ^ Sudeep to host Bigg Boss Kannada. M.tellychakkar.com (2013-02-28). ^ "Suvarna sets high hopes with Bigg Boss Kannada 2". Indian Television Dot Com. 2014-06-24. Retrieved 2018-06-18. ^ IBTimes. "'Bigg Boss Kannada': Kiccha Sudeep Turns 'Salman Khan of Sandalwood', Gets Record Offer to Host Show on Small Screen". International Business Times, India Edition. Retrieved 2018-06-18. ^ "OMG! What Is Sudeep's Remuneration To Host Bigg Boss?". filmibeat.com. 2015-07-20. Retrieved 2018-06-18. ^ "Karnataka Bulldozers". ccl.in. Celebrity Cricket League. Retrieved 2016-11-03. ^ a b "Sudeep, Priya call it quits after 14 yrs". Bangalore Mirror. Archived from the original on 12 September 2015. Retrieved 12 September 2015. ^ "Kerala, Karnataka actors are sidelined in Bollywood: Sudeep". The Hindu. 27 March 2010. Retrieved 11 September 2015. ^ "Sudeep's going strong at 40!". The Times of India. 2 September 2013. Retrieved 1 October 2014. ^ "Launch of Kannada star Sudeep's event management company Stage 360° at Bangalore". The Times of India. 18 November 2013. Retrieved 18 November 2013. ^ "Bengaluru: Actor Sudeep, Priya to end their 14-year marriage". Daijiworld.com. 11 September 2015. Retrieved 11 September 2015. ^ "Actor Sudeep, Priya to End Their 14-Year Marriage". The New Indian Express. 12 September 2015. Retrieved 12 September 2015. ^ Murthy, T. N. Vasudev (6 July 2016). "Sudeep-Priya's marriage back on track". Asianet. Archived from the original on 9 March 2017. Retrieved 9 March 2017. ^ "Sudeep: Back with My Autograph". Rediff. Retrieved 7 October 2015. ^ "Bangalore Times Most Desirable Men 2012 - Top 25". The Times of India. Retrieved 6 October 2015. ^ "Sudeepa now Abhinaya Chakravarthy". Chitraloka. 20 June 2012. Retrieved 6 October 2015. ^ Joyalukkas India Pvt. Ltd. Joyalukkasindia.com (2013-05-15). ^ Sudeep to endorse jewellery brand – Times Of India. Articles.timesofindia.indiatimes.com (2012-12-15). ^ "Intex targets revenue of Rs 6500 crore by 2016; to focus on south India". www.indiantelevision.com. 16 Aug 2014. ^ A. Sharadhaa (21 November 2013). "For a cause, Sandalwood lends its voice". The New Indian Express. Retrieved 7 October 2015. ^ "Sudeep teams up with Anant Nag for OLX ad". www.filmibeat.com. 3 Nov 2015. Wikimedia Commons has media related to Sudeep.